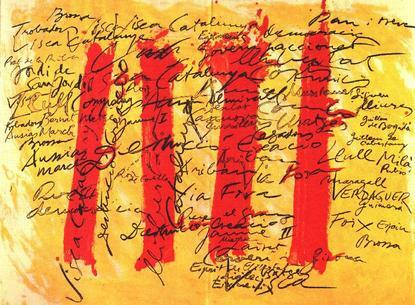 Catalonia Festivity is known as “Diada de Catalunya” and it is celebrated the 11th of Setember. With this festivity, Catalonia celebrates the the fall of Barcelona in the hands of the Bourbon troops under the Duke of Berwick during the War of Spanish Succession on September 11th, 1714, after fourteen months of siege. Institutions and political parties traditionally made floral offerings to the monuments of Rafael Casanova (Ronda Sant Pere 51, metro Urquinaona, check Barcelona Metro map here) and Josep Moragues, both in Barcelona and the rest of Catalonia. Since 2003, the main festivity is holded in Ciutadella Park (click here for Public transportation information in Barcelona). On this festivity, music, catalan personalities and thousands of citizens meet to celebrate and enjoy this very special date. During the celebration, the most relevant icons: la Senyera (Catalan flag) can be usually seen everywhere and specially hanging from balconies and the Catalonian National anthem “Els Segadors” can be usually heard as it is commonly played to exalt the Catalan feeling.